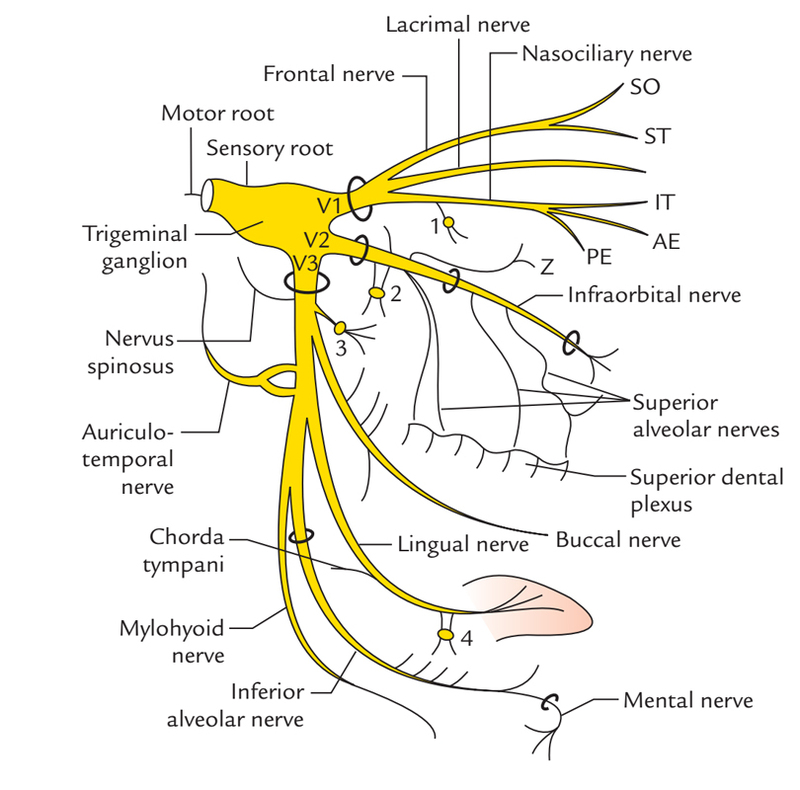 The mylohyoid nerve a.k.a. nerve towards mylohyoid is a division of the inferior alveolar nerve, which itself is a branch of the mandibular division of the trigeminal nerve. The mylohyoid nerve generally arises via the inferior alveolar nerve approximately 14 mm superior towards the mandibular foramen. Sometimes, the mylohyoid nerve emerges via the main trunk of the mandibular nerve, instead of from the inferior alveolar nerve. The mylohyoid nerve originates via the inferior alveolar nerve slightly prior to its entrance in the mandibular foramen. It perforates the sphenomandibular ligament and travels anteroinferiorly within the mylohyoid groove of the mandible along with its supplementing vessels, lateral towards the medial pterygoid muscle, instead of entering the foramen. It courses inferior to the mylohyoid muscle and afterwards in the middle of it and superior to the anterior belly of digastric, innervating these muscles. The mylohyoid nerve travels alongside the interior part of the mandibular ramus, posterior towards the mandibular foramen within an inferior course, otherwise penetrating the sphenomandibular ligament. Afterwards it arcs anteriorly in order to travel inside the mylohyoid groove which is situated directly inferior to the mylohyoid ridge beside the mandibular body. In approximately 30% of cases, the mylohyoid groove is enclosed via a thin layer of bone or periosteum and has a form which resembles a channel. While the nerve comes near to the inferolateral surface of the mylohyoid muscle, nearby its posterior border, it is intimately associated with the medial part of the submandibular gland. Then, the mylohyoid nerve produces its motoric branches towards the mylohyoid muscle and towards the anterior belly of the digastric muscle. Besides the molar portion, the mylohyoid conveys afferent sensory fibers via the teeth and skin. The cutaneous branch of the mylohyoid nerve is said to be the ending branch of the mylohyoid nerve, and it is situated approximately 9 mm inferior towards the lower border of the mandible while innervating the skin area inferior to the chin. Mylohyoid groove is located inferior to the posterior end of the mylohyoid line. Mylohyoid nerve and vessels travel in this groove. Digastric Triangle contains mylohyoid nerve and vessels in its anterior portion. Mylohyoid nerve and medial surface of submandibular gland are related to each other anatomically. Mylohyoid Nerve is an important structure in second muscular surgical plane of submandibular region. The sphenomandibular ligament is perforated via mylohyoid nerve and vessels close to its lower end. Submental artery is a large artery that goes forwards on the mylohyoid muscle along with mylohyoid nerve. At the time of genioplasty or the elimination of the submandibular gland, the cutaneous branch is at danger with possible sensitivity alterations within the submental zone. The mylohyoid nerve is frequently associated with anesthesia of the first molar. Since it frequently conveys sensory fibers towards the mesial root of the first molar, lingual anesthetic intrusion may be necessary in order to create a nerve block.